It's not often that one pattern lands on more than a few queues in the office. 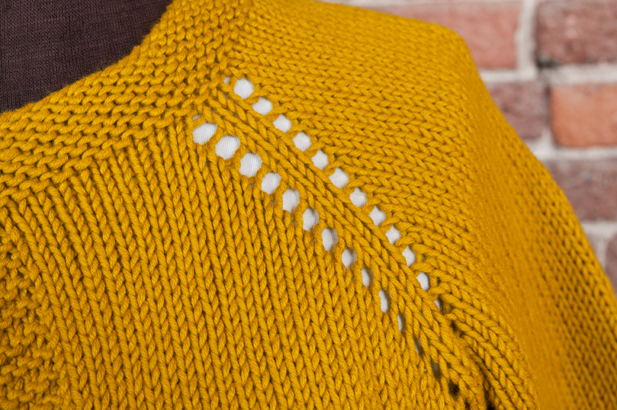 With our own gorgeous patterns to choose from, and so many fabulous indie designs in the knitosphere, it just seems that we never meet in the same spot. 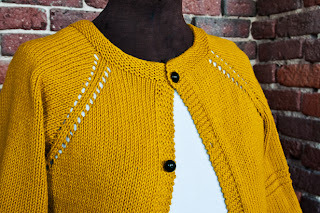 Then there was the Lodi cardigan. You might remember this little cardigan designed by Tanis Gray and knit in Solstice, from the Summer issue of Knitscene. As soon as I saw it, I knew it had to be mine. 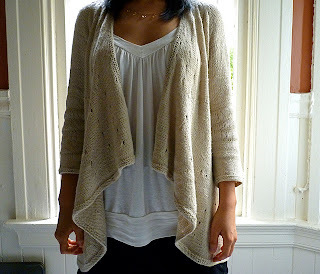 I do so love a tiny cardigan, often to my detriment, but that's a whole other story. 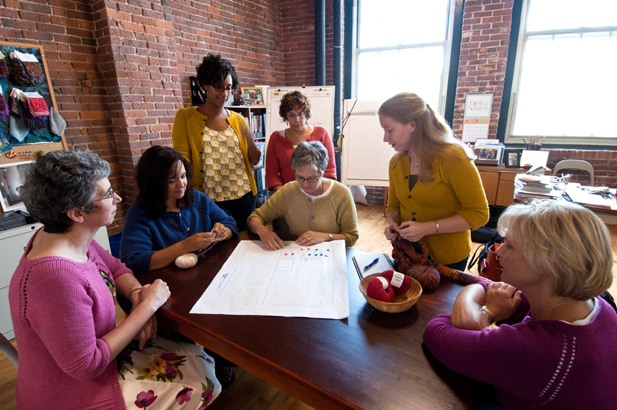 Anyway, one thing led to another and before we knew it, it was on the needles of eight women in our office! Experiences were mixed, from love for the stylish simplicity of the design, to difficulty with the grading, to a newfound appreciation for the wool-organic cotton blend we were all suddenly knitting in. Solstice is from our Verde Collection, and comes in twenty vibrant colors. The cotton component keeps the stitches crisp and clear, provides structure, and allows the finished garment to breathe. 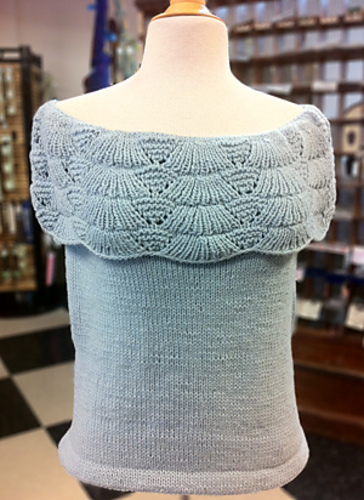 Super soft merino wool adds warmth, drape, and helps pieces hold their shape. I truly dislike weaving in ends, so I was especially pleased to learn that it can be spit-spliced (or "magic-spliced" if the thought of spitting in your yarn is especially unpleasant for you). What, people don't dress alike at your office? For those with a larger bust, take heed of your shaping! The eyelet raglan shoulders MUST be increased with each right side row, so while increasing bust size you also increase the arm size! Many who were knitting above a 38" bust had trouble with arms being too large, and remedied it in a variety of ways. 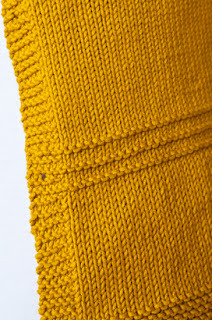 Heather (in the Azalea colorway) merely picked up stitches instead of casting on in the armpit, and knit the sleeves flat, taking in stitches in the armpit. 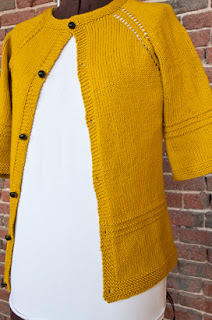 Meg, in the Brass Button colorway, swatched carefully and recalculated the distribution of the fronts and arms. 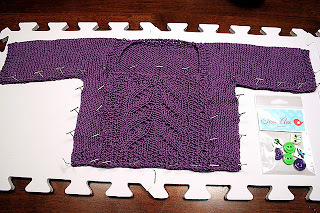 I made mine as is, but wondered in retrospect if you could pair each eyelet increase with a decrease in the armpit area--an unproven theory, but I wonder if it would work? What are your tried-and-true fitting techniques? Cheryl is a member of our Classic Elite team and works at the Hub Mills Store, our little outlet store here in Lowell. A big joke around the office is that Cheryl completes a sweater weekly in time for Thursday Knit Night. It seems like there's always something new to block, photograph or ogle! Since I'm fascinated by how prolific she is, I thought you would be too, and asked her to write about it. 33 out of the 62 use Classic Elite Yarns. 13 use CEY patterns too. Disclaimer—I work in yarn retail and am surrounded by beautiful yarns every day. And yes, I am very lucky to have this job, but there are bad things about it too. I get to see and often try on the sweaters that will be in the next season’s pattern books. And I barely have those patterns in the store when the following season’s models are floating around the office. So right now I’m working on Western in CEY Avenue in carnation from the new fall line (update: Cheryl was wearing her Western yesterday at work. Man, she can knit fast!). I have picked a color of Pirouette to make Arabesque. Others on my Must Make list from the fall line include Afternoon Light in Kumara, Oblique in a pretty rose colored Princess, Nikko in Portland Tweed, Pinnacle in Vista, and Peinture in Inca Alpaca (which I haven’t used yet and I’m really looking forward to). So will I have time to finish all of these before the spring line is out?—and from what I’ve seen so far, spring is going to be a beauty too! So, how do I pick a favorite sweater to talk about? That’s kind of like picking a favorite child—except picking a favorite child is easier. This past spring I’d have to say Honeysuckle in Firefly was my favorite. It was my first time using Firefly and won’t be my last. 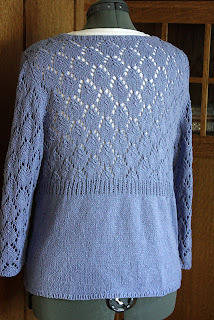 (There is a dress pattern on Ravelry that will be out soon using Firefly, and I think I’m going to have to make it.) Honeysuckle is the perfect sweater for knitters who hate seaming. The only sewing was the buttons. 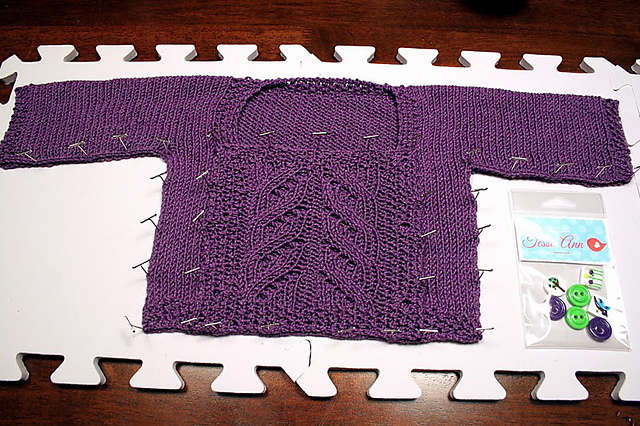 I actually like seaming, but this sweater was love at first sight when it appeared at the Classic Elite office. Honeysuckle is top down, raglan, and the shaping is built right into the charts so you don’t have to worry about eliminating yarnovers as you decrease. My biggest problem with this pattern was picking a color. They are all beautiful! Of the remaining sweaters in my projects, about 20 more use Classic Elite Yarns for independent designs—quite a few from Twist Collective. I’m supposed to start Twinings from the new Twist Collective in Magnolia next week. But I’m trying to finish at least one of the three on my needles right now before then. And I think Vista would be perfect for Crane Creek. I’m definitely going to have to increase my usual 2 sweaters/month output to get to all of the sweaters I have to make. So you can see that although I have an enviable job, it isn’t easy keeping up with the prolific designers and yarn selectors at CEY. If I could only grow a few extra pairs of hands or at least knit in my sleep, life would be easier. And of course, I have to thank my loving, patient, best husband ever who never complains about my knitting even though dishes are in the sink and we had leftovers again for dinner. Scroll to the bottom of this post for something completely amazing*. Look what I saw just sitting on one of our tables at TNNA in June. Dropped off by a mystery person who disappeared as quickly as she appeared. Luckily, there was an inscription. What a most lovely surprise from the even lovelier Ysolda Teague! I would go so far as to say this book is indispensable for knitters.You will find the patterns you're accustomed to seeing from Ysolda--fashion forward, technically sound, and well written with a touch of whimsy. However, the meat and potatoes of this book is the educational first chapter entitled "Tools for Successful Sweaters". Every word and picture in this chapter lends credence to the title. The chapter is broken into sections: selecting a yarn, swatching, taking measurements, choosing a size, creating a perfect fit, and blocking. Each section offers a wealth of information, accessible for beginners and relevant even for intermediate to advanced knitters. 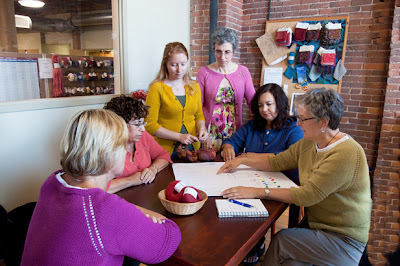 Tips are peppered throughout, from choosing the best yarn for intarsia work to measuring your body accurately to using dressmaking techniques to accommodate fuller bust sizes. 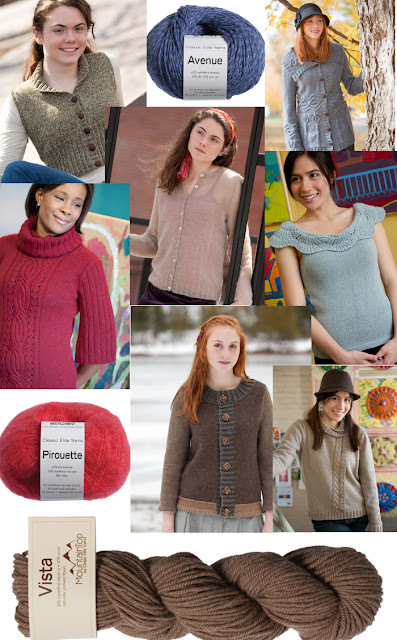 You'll find Classic Elite yarn modeled by the gorgeous Amanda Jarvis in the Angostura Vest. The introduction to the pattern has comprehensive construction and fitting notes, and the pattern is sized from a 30 inch bust up to a 60 inch one. 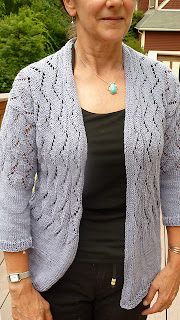 The vest is knit in Chesapeake from the Verde Collection in the colorway Mephisto, a beautiful blue that almost reminds me of one of my favorite crayons, Cornflower Blue, only darker. *Ysolda Teague and her fabulous team are collaborating with us on a giveaway! 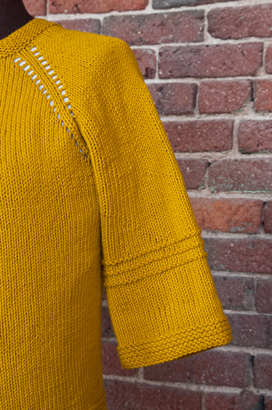 One lucky knitter will receive an autographed copy of Little Red in the City, a limited edition Little Red project bag, and enough Chesapeake to complete their very own Angostura vest! Simply head over to her blog, leave a comment on Ysolda's blog post saying how you would wear/style your own Angostura before August 15th, and then cross your fingers. Scratch to reveal the eBook link. So clever! Another installment of projects we love from Ravelry! What catches your eye? 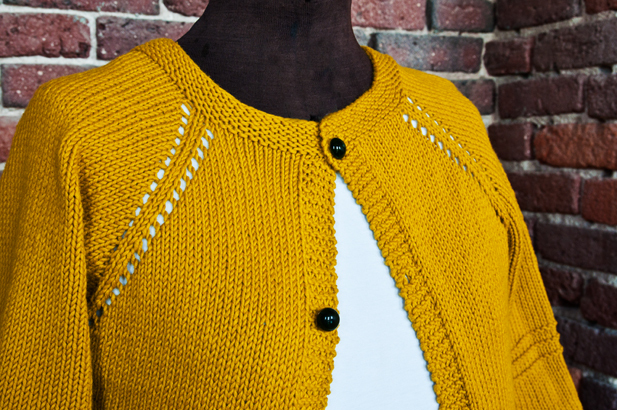 The Radian Yoke pullover from the Summer KnitScene, knit in the suggested yarn, Firefly by Austierra. Bonne Marie Burns's Vonica knit in Allegoro by Sticksnscones. 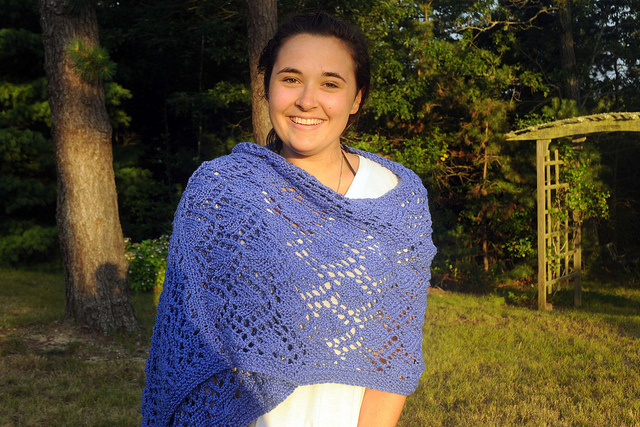 This Green Point shawl by Nichole Reese was knit in Sprout by Lousquared for her LYS's Spring KAL.